Bowens’s research and interviews with farmers of color offer hope for the future of American farms and families. If you’re interested in local, farm-to-table food systems, you’ve probably read some of Michael Pollan’s or Joel Salatin’s work. Or maybe you have a cookbook or two by Alice Waters. Aside from their eco-consciousness, these excellent writers all have something else in common: they’re white. Washington, DC, political organizer Natasha Bowens noticed this trend and was concerned that people of color lacked a voice in the changing landscape of our food systems. 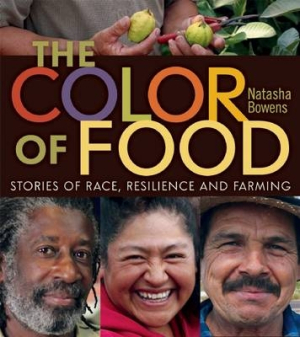 With The Color of Food: Stories of Race, Resilience, and Farming, she sets a welcoming place at the table for African American, Latino, Native American, and Asian farmers to share stories that restore their personal and political perspectives to the story of modern farming. Bowens’s deep political understanding is obvious throughout her book; she’s knowledgeable about the history of oppression that affects farmers of color today and can explain the effects of political pacts like NAFTA on Mexican farmers, all while delivering pertinent statistics that illustrate her points. At heart, though, this is a book about the people themselves. Bowens’s stunning portrait photography captures the faces of the folks she met on her five-month trip from North Carolina to Texas, to California, and back again. Extensive quotations from the people she interviewed let us into the everyday life of people like Carol and Joyce, black sisters in their sixties working to bring back their Burgaw Creek, North Carolina, farm. Or Ethiopian Menkir Tamrat, whose family taught him to use only the freshest ingredients—if it had to be refrigerated, it was probably too old—which he now grows in Fremont, California. Without exception, the people Bowens interviewed have had tough lives; their conversations with her, however, strike a uniformly positive note of hope for the future of their farms and families. Young farmers carry this hopeful message at the end of The Color of Food, where we read about activists like Kandace Vallejo, a young Chicana woman working for food justice for the Mexican population in Austin, Texas. A half-dozen similarly forward-looking stories round out Bowens’s trailblazing look at the past and present of North American farming.